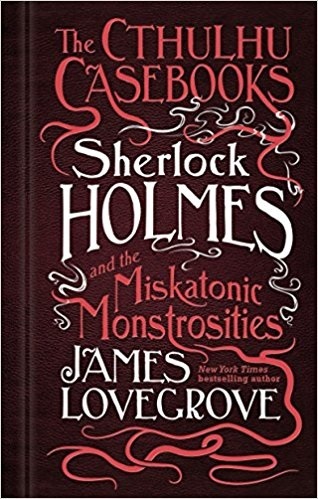 Reimagining the Holmes canon as false stories to hide the truth, Lovegrove delves deep into the Lovecraft Mythos. Holmes and Watson are warriors against the Great Old Ones and their ilk. Stories Holmes aficionados know and love are cast in a different light, some of them quite ingenious. In this volume, fifteen years have passed since the events of The Shadwell Shadows. Mary Watson is now dead from being torn apart before Watson’s eyes by a fell creature. Holmes and Watson grip at each other and seem on the verge of losing it altogether. We get a very grim and gritty version of The Sign of the Four, with both the participants and the treasure imbued with Lovecraftian terror. Still reeling from this encounter, Holmes and Watson are alerted by a new menace that nearly proves fatal! An American, Zachariah Conroy of Boston, is being held in Bedlam, spouting nonsense and scared out of his mind. He is then snatched from the asylum by a nightgaunt. Tracing the creature, Holmes and Watson find an isolated farmhouse in the Rainham Marshes. There they discover that the nightgaunt is controlled by another American named Nathaniel Whateley. Whately tells a tale of a frightful expedition up the Miskatonic River, a place generally forbidden even by the Native Americans in the area. A chilling count of the Red Leech is part of that strange story. Zachary Conroy accompanies Whateley on this journey, and it is his journal that provides the knowledge here. Whateley is a strange man, who keeps collecting of weird creatures and reads from a stolen copy of The Necronomicon. Conroy has his own macabre experiments, so unsettling that he has been asked to leave Miskatonic University. He has discovered how to place the mind of one creature into another. Far from discouraging him, Whateley helps him refine the process and urges more radical experiments. The story is well written, exciting and with a shade of horror throughout. Some of the characters are not what they seem and the reveal is well worth waiting for! Loved it!